Use the Action groups advanced configuration dialog box to make additional configuration changes that apply to all action groups of the selected System Profile. Fallback metric Each action group can define its own performance metric. The performance metric determines the Apdex rating. When a defined performance metric is not available for a specific user action, the fallback metric is used instead. Visits, User Action PurePath and User Actions dashlets all display an Apdex rating. There is also a column to display the performance metric that was used. See Dashlet metrics applicable to action groups for an example of how these action group metrics display in the User Action PurePath dashlet. Fallback threshold This is the threshold used when the fallback metric applies. The value sets the threshold for a satisfied visit. When the fallback metric value is less than or equal to this specified fallback threshold, the Apdex rating of Satisfied is given. Region threshold factors Use Region threshold factors to define thresholds that apply only to a specific region and country combinations. Region thresholds are useful for specific regions where a reduced performance may be expected due to factors such as slow Internet connections. Click the Create button next to the Region threshold factors list to define country/region threshold factors. Adjust the threshold when the bandwidth is low. AppMon takes low bandwidth into account when calculating the Apdex rating. It calculates a factor that the threshold is multiplied by based on low bandwidth performance. For example, if the bandwidth is slow, AppMon adjusts the threshold to lengthen the time that qualifies as a Satisifed visit. This setting is enabled by default for profiles created in AppMon 6.5 and earlier. Select this option to enable this setting for profiles created with AppMon 2017 May and later. 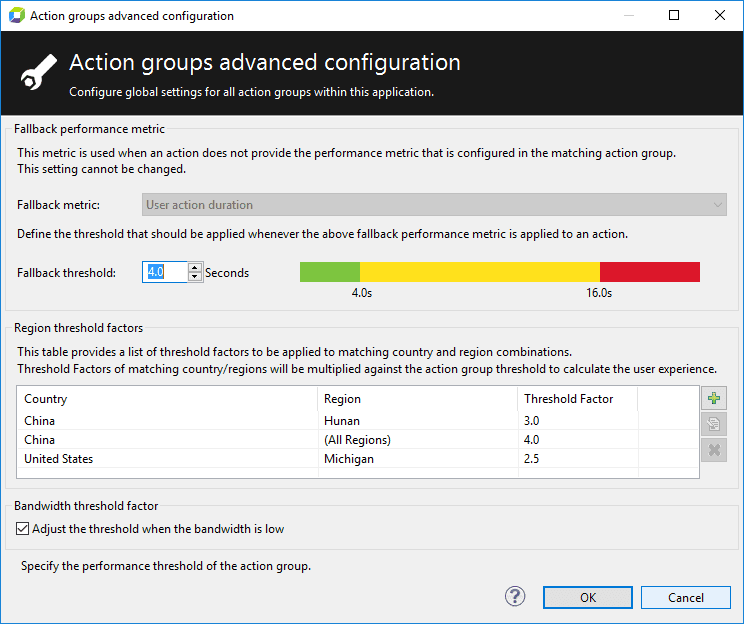 Use the Country Region Threshold Factors dialog box to add threshold factors to apply to a specific Country and region. Enter the required threshold factor that each region should use. The threshold factor is multiplied by the performance metric&apos;s threshold to determine a new threshold. For example, the threshold for a specific action group could be set to 4 seconds. However, it could be expected that visits from the Hunan region of China are expected to be slow because users connect only through WiFi. The setting for China - Hunan multiplies the threshold by a factor (3 in this case). Any performance less than (12 = 4 x 3) seconds is marked as Satisfied. Country Select the country for the threshold factor you are defining. Region Select the region within the country from the list. Only regions specific to the selected country appear in this list. Threshold factor This is the threshold to be used for the specific country/region definition. This factor is multiplied by the action group threshold to calculate the user experience for the specific country/region setting. The following image shows the metrics appropriate for action groups as displayed in the User Action PurePaths dashlet. You can use them to determine how AppMon calculated the Apdex for a specific user action. Action Group The action group used to calculate the Apdex rating. Performance metric The performance metric is used to calculate the Apdex rating. It is defined in the appropriate action group. If the defined performance metric is not available when the PurePath processes, any defined fall back performance metric is used. This column shows which performance metric is used. Performance value The value of the performance metric that was used. Factor/reason The criteria used to determine the performance metric used. More than one factor could be true, in which case the lowest threshold factor applies. For example, if the Country/Region is defined and there is slow bandwidth, only the lowest factor applies. Country/Region: A Region threshold factor applies. Low bandwidth: A factor based on low bandwidth applies. -: No factor applies, the action group&apos;s performance metric is used. No additional threshold factor applies. Threshold factor The factor that the threshold is multiplied by to determine the threshold. This value is 1 if no additional factor applies.